Litecoin over $200 | Why Did Litecoin Spike Today? Here are 4 Reasons. 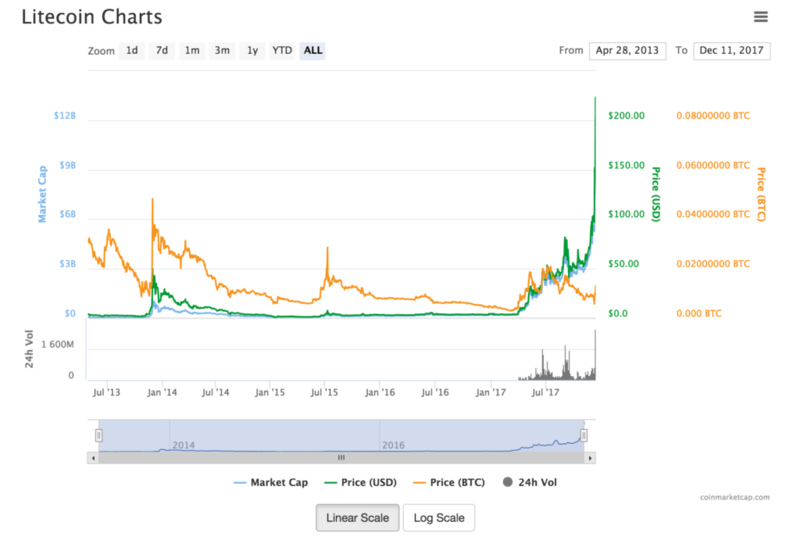 Over $200 – Why Did Litecoin Spike Today? The price of Litecoin leapt 50% today to over $200 per token. As of this post, Litecoin is at $216.91. The current price of Litecoin can be found on CoinMarketCap. 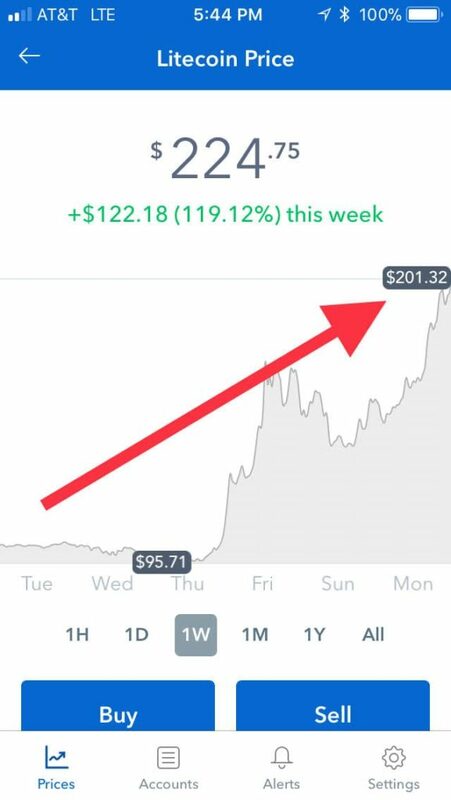 Wait… But Why Did Litecoin Spike Today? Reason 1: Bitcoin Futures Are Fueling Speculation in Litecoin. Litecoin may have spiked today because Bitcoin did not crater today as expected. Indeed, Bitcoin’s price continued to rise in spite of the launch of Bitcoin futures markets which had raised significant uncertainty among speculators. The addition of futures markets was expected to fuel volatility in Bitcoin because futures can put downward pressure on investments by allowing speculators to wager that Bitcoin will fall as well as rise. As such, there was widespread speculation among currency and stock investing experts that Bitcoin would crash today with the launch of Bitcoin futures on the CBOE. Instead, Bitcoin continued its march higher proving many experts wrong who had predicted short sellers would have a field day with the speculative bubble, crushing the price of Bitcoin today. However, the opposite seems to have happened and Bitcoin gained even more credibility with the launch of futures contracts. This euphoria may have spilled over into other legitimate cryptocurrencies, such as Litecoin and Ethereum. Litecoin is often referred to as the crypto Silver to Bitcoin’s Gold. As a result, the rise of Bitcoin may be having a halo effect on other major cryptocurrencies, fueling speculation in a bullish future for Litecoin. While Litecoin and Ethereum have important differences, including unique scalability advantages over Bitcoin, the two seem to travel somewhat in tandem with the price of Bitcoin. Users of Coinbase, the most popular trading site for cryptocurrencies, have a choice of only three cryptocurrencies to choose from: Bitcoin, Litecoin and Ethereum. As such, when creating Coinbase accounts for the first time, investors may be easily hedging their bets across all three cryptocurrencies as they begin investing on the platform. Litecoin is 4x “lighter” than Bitcoin, and as such can be transacted four times more quickly… This size benefit also translates to the number of Litecoins that can ultimately exist being 4x greater than the number of Bitcoins. Specifically, 84,000,000 Litecoins. Litecoin uses less energy to process each hash than Bitcoin because of the greater number of Litecoins that may ultimately exist. As mining for cryptocurrencies is a competitive process, the more scarce a cryptocurrency becomes, the more energy intensive it is to mine. However, Litecoin is not only faster to use than Bitcoin, it is also less expensive to use. According to BitInfoCharts, the transaction fees for Litecoin are only around $0.27 cents per transaction as of today. Contrast this with the $19.54 per transaction fee for Bitcoin, as listed on BitInfoCharts and you can understand the advantage of one over the other. Ultimately, the number of Litecoins is limited at 84 million Litecoins. This is 4x the number of possible Bitcoins. Litecoin is considered both a cryptocurrency that can be used for purchases as well as an “asset” in the sense that it may represent a store of value, similar to physical gold. The fact that it is ultimately a scarce resource may make it more akin to an asset, such as silver or gold, than a currency that will be used for transactions.